As the science and technology developed, in modern life, we have become accustomed to using electronic products bring us convenience. With the advances in human-machine interface, touch interface has been gradually took their place in life. In the past, we need many products to complete one job. They are integrated into one single device now. Portable electronic devices with compact size have become essential goods. Variety in the product set of integrated circuits shrink in a very small space, product design and production, a lot of challenge environment stress conditions should be faced for the electronic devices. Owing to the ever-changing environment of human life, the need for these highly reliable degrees, challenge a variety of harsh environments people contacts. Based on the compact and potable application of various technologies research and development in recent years, LCD flat panel display has become the mainstream display products. With the diversity of products, production development, the display device is not just at home, work environment will appear, in many people's carry bag to put a lot, such as: mobile phones, music players, tablet computers, notebook computers ... and so on. With the evolution of touch technology, the display device is no longer used for display purposes only as in the past, combined with touch technology, making it no longer only a expensive heavy product, but a vade mecum! Touch research and development for decades, according to induction principle to distinguish to resistive, capacitive, sonic formula (Surface Acoustic Wave) and optical, and other four main. Currently on the market, in addition to the resistive touch has been widely used, but in the case of the most fiery capacitive touch because of its contrast with dust, fire, scratch-resistant, strong and durable and has a high resolution, etc., are widely used in smart phones, tablets and e-book. With the rapid popularity of handheld devices and diversity of choice, consumers are getting that product reliability is an important factor in buying one, so the plant in addition to the major international performance for the hardware and software on the design, for products are facing environmental factors, as well as consumers of operation must increase product reliability simulation, in which the electrostatic discharge (ESD) problem, is not easy to solve an important problem. When the integrated circuit (IC) binding to the system, because the system often lack the mass production and final products ESD protection solutions. Often to the mass production of the product to enter the initial stage, they begin to find the problem. So many questions to track and temporary remedial work is hastily started and spent a considerable cost and risk. If you can at the beginning of the system design is considered good design, it will save a lot of manpower and time to spend. Classified according to the structure, the surface of the touch panel can be classified into contact-type (touch surface) and internal projection-type (inner touch) as shown in Figure 1 (a) and (b). The contact-type touch panel by the thickness of the surface protective layer effects, and then refer to the breakdown electric insulating material, the touch panel surface and the inside of the capacitance element is formed between an enormous electrostatic field voltage. When the pressure exceeds the critical electric field, as shown in Table I, component induction or direct inflow of quiescent current will have the opportunity to inject into the control IC. 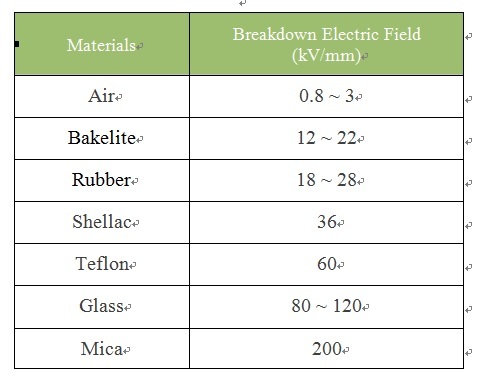 In addition, the surface electrostatic charges of the touch panel will have the opportunity to discharge along the surface of the glass to the edge, to the conductive layer inside the glass, and into the control IC or ground wire. Owing to most of the touch glass outer be indium tin oxide (Indium Tin Oxide, ITO) isolation layer (Shielding Bar) is designed , in some coating of small handheld devices , the electrostatic chance to be released directly into this position , so the Figure I (c) the line distance Δx and pressure , has become important on the electrostatic protection observed. However, regardless of different designs for glass types, touch IC types, or even the panel driver IC with built-in touch function, touch IC design is used to sense electrical variation on the surface of the panel. Therefore the environment or human with large electrostatic charge to touch the panel will also let touch IC sensed a huge noise. The detecting pin of touch IC will inevitably contain ESD protection circuit, the huge trigger signal will be through the ESD protection circuit and flow into the power or ground lines of the IC. And the increased power once more than IC limit potential, will damage the IC, or induce internal circuit malfunction. Of course, for the panel driver IC with built-in touch function, the noise impact issues will be more complicated. Touch function issues and display function issues will be mixed together due to the power/ground plan in the IC. This full chip ESD protection and floor plan design of the driver IC is became very important. To solve the problem of electrostatic discharge , there are many techniques can be applied, from the mechanical design, production control, system circuit or component characteristic design ... and other tactics to do protection. The basic principle is the physical key components to reduce the discharge current , to reduce this static current method. Firstly, to increase the impedance path , and the other path is to reduce the voltage drop. System-level ESD protection design, with a low trigger voltage, low clamping voltage and protected paths in parallel, can withstand higher secondary breakdown current (It2) components, has now proven the main method. Therefore transient voltage suppressor (TVS) has been accepted by the market, and has been widely used. Figure 2, in actual use, as the previous analysis shows. Touch panel most frequently occurring problem is that required physical characteristics of the display structure and exterior electrostatic voltage of the dual roles must exceed this limit exists strong electrostatic physical limits in order to achieve effective discharge protection values. For example: In the display system, each of the system or internal ground, with internal powers or the signals between, it is necessary to clamp the design sufficient potential drop, so that the internal power supply to the ground or inside the system signals to the ground potential difference can be clamped. General internal projection system, the signal less opportunities directly to the collapse of the protective layer from the touch panel surface of the direct current. The major issues affecting mostly coupled to the power supply , unless physical limitations has reached its limit , the sensing signals only need to be plus clamped components on the power to ground and other interface connector signals such as USB i/o. After a series of rigorous product development process, if it is because a small oversight, which will affect the product quality and cause reliability problems. This result, in addition to affecting the company's goodwill, but also between the companies will lead to the issue of compensation. Caused by a series of business losses, but also cause damage to brand image. So prevention is better than cure, and can really reduce the risk of production and customers, but also improve the quality of image. Figure 2: The ESD potential hazards for control IC in the FPC of touch panel module.